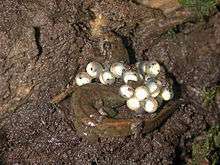 A clutch of eggs refers to all the eggs produced by birds, amphibians, or reptiles, often at a single time, particularly those laid in a nest. In birds, destruction of a clutch by predators (or removal by humans, for example the California condor breeding program) results in double-clutching. The technique is used to double the production of a species' eggs, in the California condor case, specifically to increase population size. 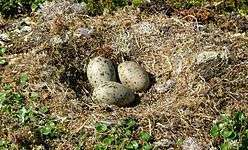 The act of putting one's hand in a nest to remove eggs is known as "dipping the clutch". Clutch size differs greatly between species, sometimes even within the same genus. It may also differ within the same species due to many factors including habitat, health, nutrition, predation pressures, and time of year. Clutch size variation can also reflect variation in optimal reproduction effort. Long-lived species tend to have smaller clutch sizes than short-lived species (see also r/K selection theory). The evolution of optimal clutch size is also driven by other factors, such as parent-offspring conflict. Clutch size recorded in ornithological field notes may or may not include lost or broken eggs. This article is issued from Wikipedia - version of the 4/16/2016. The text is available under the Creative Commons Attribution/Share Alike but additional terms may apply for the media files.